This is the largest model SOG has created to date. 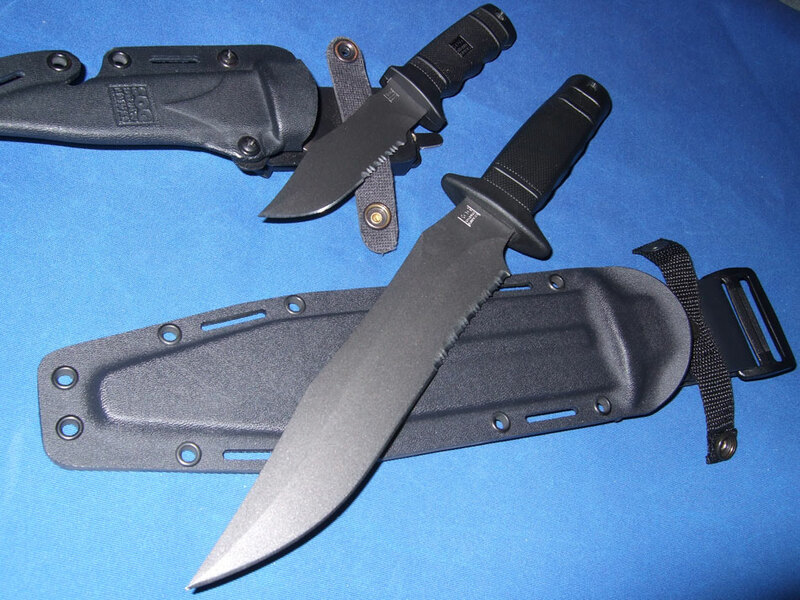 What originally started as the SK-5 steel satin-finished Tigershark slowly transformed into the powder-coated (SK-5 steel) plain-edged Tigershark in 1997, followed by the powder-coated AUS-6 plain-edge Tigershark and finally the addition of serrations to the current Tigershark model in 1999. The Tigershark is the big brother of the "Seal 2000", which the US Navy SEALs used. 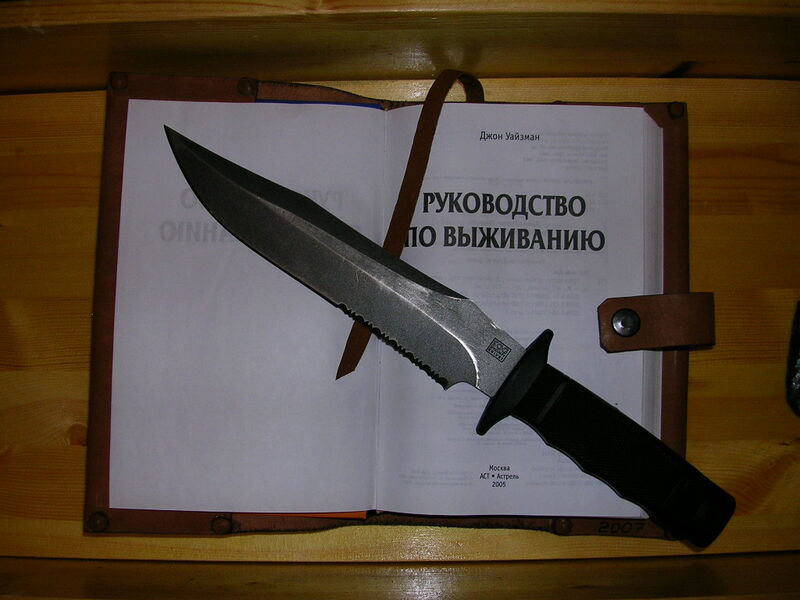 This knife is lauded as a good chopper but some have commented on the use of AUS-6 steel which, though more resistant to rust, does not match up to SK-5 steel in terms of edge-holding properties and slicing ability. The serrations were not welcome by some too. Other things of interest: Newer models have the new "split bullet" logo vs old models with "square SOG" logo. Plain edge powdered Tigersharks are a little hard to find. Don't worry about the one that got away, the SOG Tigershark took care of that small fish! This versatile field knife dominates on land or sea. 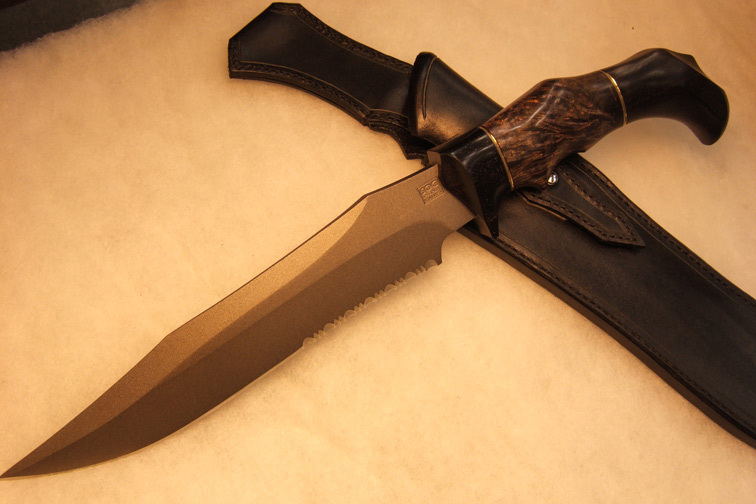 The larger version of the SEAL Knife, it has a massive 9" bowie-style blade that is powder coated and partially serrated. This striking knife is razor-sharp and strong with our deepest serration yet, so it easily takes on big or small cutting, slicing and chopping chores. The Tigershark's contoured Kraton handle features aggressively textured scales for a solid and comfortable grip. 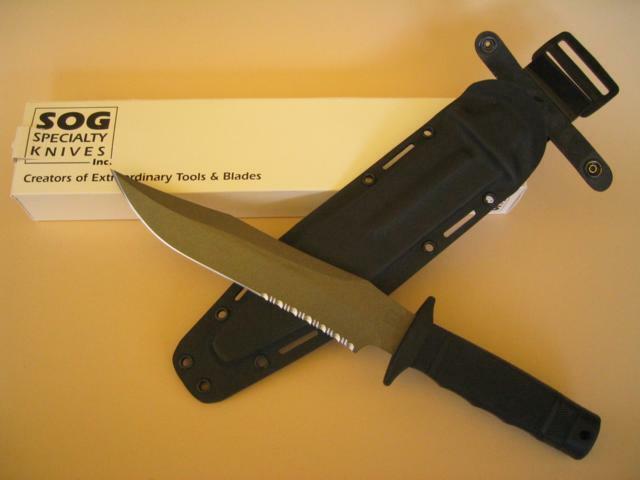 Furthermore, forget the basket, this big fish carries in SOG's jump rated Kydex sheath.